Steam Wallet Code allows you to top-up your steam account and enables your steam wallet. 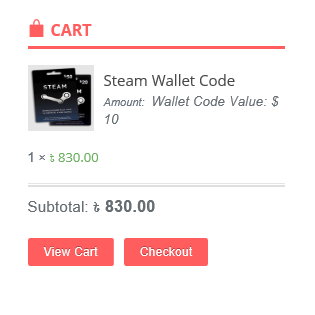 With this Wallet Code you can buy your favorite games; choose from all the best titles on PC, Mac, and Linux – from current blockbusters, greatest hits, to the best of the independents. Also you can buy from Dota 2/CS:GO stores, and use Steam Community Market. Note down the total value. Use BKash to complete the payment and enter the TRANSACTION ID. You do not need bKash account to make payment. You can go to any bKash agent in any shop and make the payment. During order placement, you will be given the bKash number. You can backorder products that are out of stock. However, we can not guarantee immediate availability. When products are restocked, backorders will be fulfilled first (in chronological order). Generally, if you place a backorder, it will take 15 to 20 days to fulfill (it can be quicker though). You will receive an email with your Steam Wallet code. Enter the Wallet Code and follow instructions. If you do not have Steam Wallet activated, this will activate your Steam Wallet automatically! Steam Wallet Codes offered subject to your acceptance of the Steam Subscriber Agreement (“SSA”). To redeem your Steam Wallet Code, you must have or create a Steam account and accept the SSA. Please see http://www.steampowered.com/agreement to view the SSA prior to purchase. Absolutely no refund for Steam Wallet Codes except backorders that we can not fulfill within 30 days. Refunds will be made after deducting any payment processor fees (bKash fees etc. ).